Andrew Schnorr is the creator of Elderly Apple. His capacity to stick to a daily schedule over the course of years, is to Dumb Bum, incomprehensible. We tried to talk him into giving delays a try, keeping the fans waiting, we tried distracting him... Nothing worked. The guy is a commttmentphiliac. I don't know what he's eating, but I bet he does THAT every day too... Lucky Andrew. Anyway, once upon a time, Elderly Apple reached another milestone (the comic had several thanks to that committed personality of its maker) and it was time to show Andrew how it's done. We were late with our fan art, we believe we were the last to submit it, we believe his heart melted, because he was sure we wouldn't send anything... Our idea was to do a single panel like the ones in his comic, using his elderly apple character. 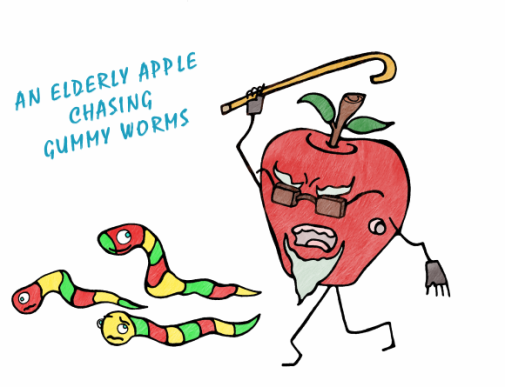 The gloves and the glasses are a reference to the Elderly Apple Guy (Andrew's creative persona). Go read the comic, it's quite unique. And for us it's been a great source of inspiration and a daily joy to read.